Hungry Couple: I am Bubbly and Full of Sunshine! That, at least, is the opinion of Chock Chip Uru, the resident kitchen diva over at Go Bake Yourself, who has given me the Sunshine Award. If, for any reason, you have not already visited this lovely Australian girl's blog than get over there at once. I would, however, advise you to lose some weight first because you will want to eat everything in sight! I am not certain what the rules are for this particular award but I'm going to pass it on to one of my favorite bloggers. No matter what she's cooking, I will always read her posts because her humor will be sure to leave me smiling. She's recently had a personal difficulty and, even while telling her readers about it, still managed to lay on the wit and charm. 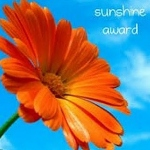 What better recipient for the Sunshine Award than Janet at From Cupcakes to Caviar. Speedy recovery, my friend. Enjoy! Congrats on receiving the award. Also, you have picked an excellent blogger to pass it along too, I am sure it made Janet's day! As did your nominee - nice choice! Awwww... thank you SOOOO much Anita!!! I am honored to have received this form you, one of MY favorite bloggers.